Your wedding day is a time to celebrate love, happiness and good fortune. For many couples, incorporating some ethical elements or charitable giving into their special day is a great way to spread the love even further by helping those who need it most. Buying your dress at one of Oxfam Ireland’s bridal shops makes a real and lasting difference by raising vital funds for our work worldwide, from making sure communities have clean, safe water when disaster strikes, to helping female farmers grow more crops or getting more girls into school. Our Oxfam Bridal boutiques on George’s St in Dublin and on Main St in Bangor offer a wide range of mostly brand-new dresses and accessories for your big day. You can browse the rails and try on dresses – accessories and shoes too! – in private and in comfort with the undivided attention of our staff. Contact our Oxfam Bridal boutiques to make an appointment. 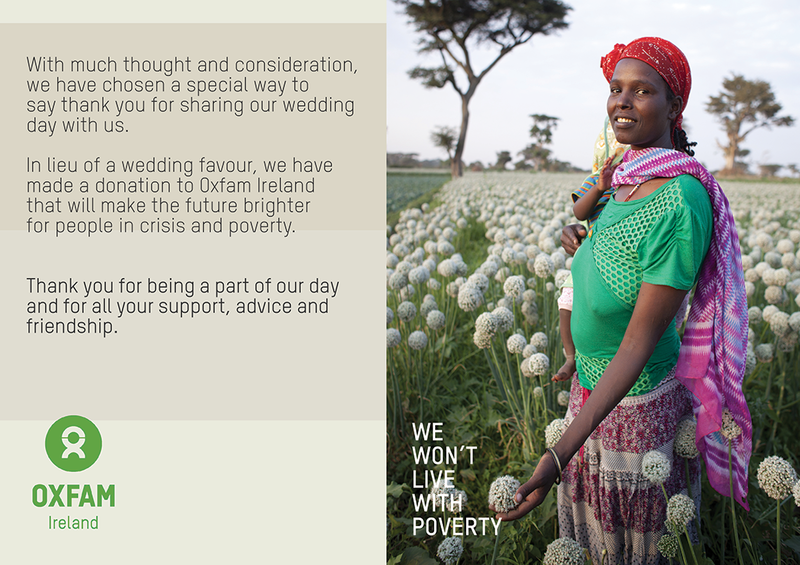 Wedding favours are now available from Oxfam Ireland! The money raised through the sale of wedding favours supports our work worldwide, from saving lives in emergencies and helping people build better lives through long-term development work to speaking out on the issues that keep people poor. Why not gift “calorie-free Chocolate” to your guests? This favour comes in packs of 10 and can be placed at table settings during dinner. Inside each card a blank space allows you to add your own personal message to your guests. Our wedding favour cards can be ordered online and cost €50 / £40 per pack – order yours today! If you would prefer to make a donation to Oxfam Ireland in lieu of wedding favours, you will receive a certificate which you can print off and place on tables or in a frame at your reception. This is a very popular way to give back. As many couples already live together and have all the household items they need, instead of creating a wedding list, they suggest guests make a donation to Oxfam Ireland. It’s easy! You create an online gift register page and share the link with your guests so they can give the gift that gives back on your behalf. When the big day is over, why not make space for Oxfam by donating your wedding dress to Oxfam Bridal? Our shops also take bridesmaid dresses and other accessories too, including those decorations you no longer know what to do with! Donating your pre-loved dresses and other items lessens manufacturing demands and keeps more items out of the landfill. Simply drop your items into your local Oxfam shop or into your nearest donation bank. Several vendors donate all or a portion of their proceeds to charity. If you’re shopping online, a great way of finding out which retailers give a percentage of your purchase back to charity (at no additional cost to you) is by using services such as HelpFreely. By installing the Helpfreely App on your browser, you can raise funds for Oxfam Ireland simply by signing up and creating a HelpFreely account – get started here! 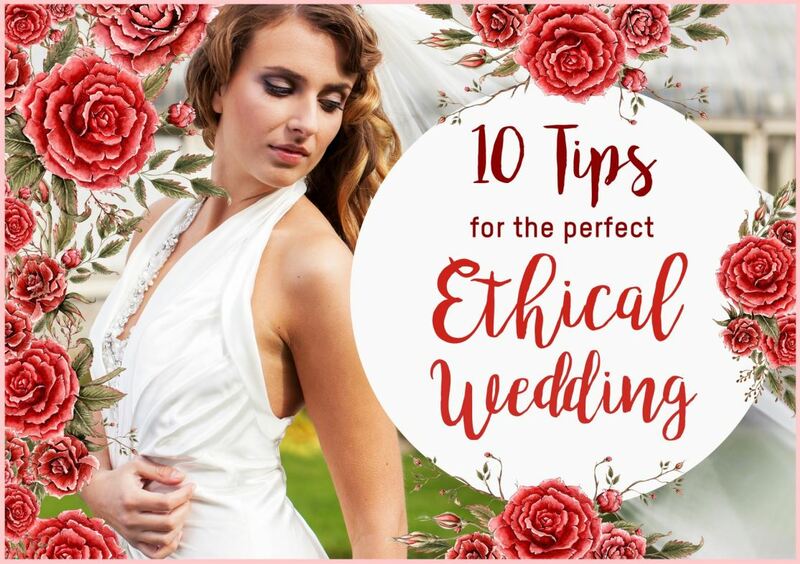 Don’t forget to download our latest free eBook, “10 Tips for the Perfect Ethical Weddings” for more great ideas on how to give back while you plan your special day.